We Are Sale Moor are pleased to have won a prize for our entry in the #BeBoldTrafford competition run by Trafford Partnership! We entered the below photograph of our tea party event via Twitter and Facebook and received the good news today. We got first pick of the prizes and have chosen 4 tickets to the first Manchester United game of the 2016/17 season. We will be looking at a way to raffle these tickets off to raise funds to put on more events to serve our community. The plans for a supermarket development came before the planning committee on 14th July, and despite our best efforts and some very good arguments from local councillors, the plans were approved. However the council still have not yet agreed to sell the land. We are now planning to work with the leader of the council Sean Anstee on an options review for the land, during which we will gather community opinions. Our vision is for Sale Moor to be a thriving, caring and safe community that celebrates independent businesses and welcomes people to our village. We have a six point strategy underpinning that vision. Keeping Sale Moor independent is the main focus of our strategy, which has been developed in consultation with the local community. We know that the council need to sell the car park and it needs to be a profitable deal for the Council however we want to work with the Coucnil to ensure that the decisions made are in the best interests of the local community. Keeping our high streets healthy is a national issue and Sale Moor has a high street that is working. We think it could be even more successful and want to work together to maximise the opportunity that we have - a supermarket would therefore undermine everything we are working for. Thank you to everyone who has provided support so far. Our work is not yet done - we still have a long way to go to shape our Neighbourhood Plan and hopefully come up with an agreed solution for this land that suits the community and the Council. In March, Trafford Locality Partnership launched their 2016 Make Sale Smile funding scheme, which gives local groups an opportunity to apply for a share of a £20,000 pot to deliver projects that benefit Sale and it's residents. 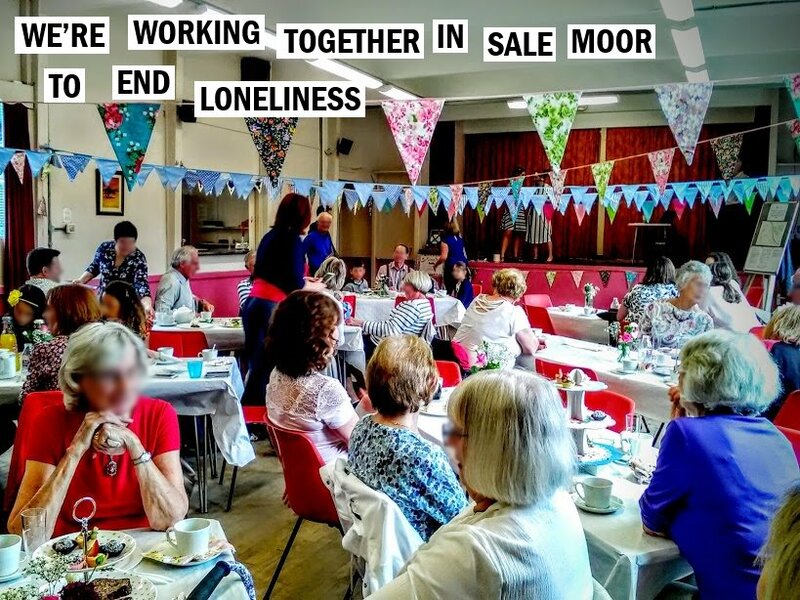 The 'We Are Sale Moor' neighbourhood forum group applied for the larger grant of £1500 (available to constituted groups) with the idea of a pop-up cinema event to be held in Sale Moor. Winners were determined by a public vote at the family fun day at Worthington Park on 19th June and we are pleased to announce that We Are Sale Moor won the £1500 prize for our idea! The money will go towards hosting the event including the purchase or hire of equipment. Further details of the event will be announced on our website and via the social media channels (below). ﻿﻿The fight to save Warrener Street car park is not over. Our petition has been re-opened. A developer has submitted an application to Trafford Council and, despite the council saying they would not sell the land to them, this could easily change if planning consent is granted. Our fight is far from over and we need your help. Thank you to all who signed the petition and posted comments so far, but please spread the word as we now once again need to build up support. Lets try to reach everyone in Sale Moor, so speak to your neighbours, shopkeepers, and folk you bump into in the village. The link to the planning application where you can also make comments / objections is below. Almost 1500 supported the petition against a supermarket in Sale Moor. Unfortunately this is a battle we're likely to continue facing. However there is something we can do about this - we can put forward a long term 'Neighbourhood Development Plan' to shape and define the kind of development we want in our village. We want residents, traders and shoppers of Sale Moor to have your say and tell us what you want for the future of our village. I would like to invite you to attend a commmunity event at Worthington Primary School on 9th February at 7pm. The event will be run by community organisers and will also be attended by some local volunteers (residents and traders) who are working to set up a Neighbourhood Forum that will eventually drive the Neighbourhood Plan. Everybody has an important opinion about their future vision of Sale Moor and we want your ideas to feed into the decision making process. If you are unable to attend but would like to contribute your views, or if you would like more information, please email wearesalemoor@gmail.com or see our Contact Details page.